What would be a better place to escape summer than an Olympic sized sheet of ice? Prepared, clean, smooth ice. Judging from yelp reviews, Iceplex seems to have quality ice, definitely one of the key factors for an ice skating rink. Iceplex is also where kids and adult hockey leagues meet and where you can send your youngens to become world-class figure skaters. 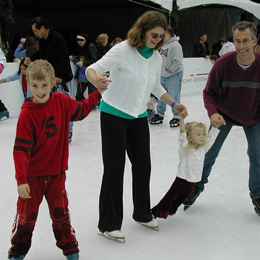 The Open House will include a hockey and a figure skating exhibition; sign-up for the fall season is just around the corner and classes (ages 3 and up) start after Labor Day. IcePlex is just outside the beltline. From downtown, take Capital Blvd. and (soon after crossing 440) turn right onto Brentwood and go about a quarter mile. This entry was posted in Active, Sports by daddyweekly. Bookmark the permalink.